Many thanks for your letter and the 50 Fr. note enclosed. I don't see the whole future black, but I do see it bristling with difficulties and sometimes I ask myself if they won't be too much for me. But this is mostly in moments of physical weakness, and last week I had such a fierce toothache that much against my will I had to waste time. Well, today I've taken the right wing of this complex, which contains 4 rooms, or rather two with two closets. It is painted yellow outside, whitewashed inside, in full sunlight. I have taken it for 15 Fr. a month. Now my idea would be to furnish one room, the one on the first floor, so as to be able to sleep there. This [house] will remain the studio and the storehouse for the whole campaign, as long as it lasts in the South, and now I am free of all the innkeepers' tricks: they're ruinous and they make me wretched. Just now Bernard writes me that he also has a whole house, but he has his for nothing. What luck! I'll be sure to make you a better drawing of it than the first sketch. And after this I can venture to tell you that I mean to invite Bernard and others to send me pictures, to show them here if there is an opportunity, which there certainly will be in Marseilles. I hope I have landed on my feet this time, you know - yellow outside, white inside, with all the sun, so that I shall see my canvases in a bright interior - the floor is red brick; outside, the garden of the square, of which you will find two more drawings. I think I can promise you that the drawings will get better and better. I have had a letter from Russell; he has bought a Guillaumin and two or three Bernards. And, what gives me enormous pleasure, he also writes suggesting in exchange of studies. I should be afraid of nothing if it wasn't for my cursed health. All the same, I am better than I was in Paris, and if my stomach has become terribly weak, it's a trouble I picked up there and most likely due to the bad wine, which I drank too much of. The wine is just as bad here, but I drink very little of it. And so it comes about that by eating hardly any solid food and hardly drinking I am pretty weak, but my blood is getting healthier instead of getting poisoned. Once again, it's patience I need to see me through, and perseverance. The absorbent canvas arrived a few days ago, so I am starting on a new size 30 canvas which I hope will be better than the others. Do you remember in La Recherche du Bonheur the good soul who bought as much land as he could go around in a day? Well, in my orchard decoration I have been more or less like that man; I have half a dozen out of a dozen now, but the six others are not so good, and I am sorry I didn't do just two instead of the last six. At all events I will send you ten one of these days. I bought two pairs of shoes, which cost me 26 Frs., and three shirts, which cost 27 Frs. This means that in spite of the 100-franc note, I am not rolling in money. But in view of the business I count on doing at Marseilles, I want to be well turned out, and I mean to buy nothing but good stuff. The same with the work: it is better to paint one picture less than to paint one less well. If it should actually come to a break with these people, don't think that I doubt the possibility of carrying on the business all the same; but we must not be taken by surprise, that's all, and if there is still a little delay, it's all to the good. For my part, if I have the next few months to get ready for an expedition to Marseilles, I can carry on there with more assurance than if I arrive all out of breath. I have seen Mr. McKnight again, but so far nothing of his work. I still have paints and brushes and several other things in stock, but one must not waste one's powder. I think, supposing you leave those worthies, I must manage to live without spending more than, say, 150 Frs. a month; at present I could not do it, but you will see that in two months I shall be settled accordingly. And if by that time we are earning more, so much the better. I want to make sure of that. You know, if I could only get really strong soup, it would do me good immediately: it's preposterous, but I never can get what I ask for, even the simplest things, from these people here. And it's the same everywhere in these little restaurants. But it is not so hard to bake potatoes? Then rice, or macaroni? None left, or else it is messed up in grease, or else they aren't cooking it today, and they'll explain that it's tomorrow's dish, there's no room on the stove, and so on. It's absurd, but that is the real reason my health is low. All the same, it cost me positive agony to decide on a definite step, for I reminded myself that in The Hague and Nuenen I had tried to take a studio, and how badly it turned out! But many things have changed since then, and the ground feels firmer underfoot, so let's get on ahead. Only we have spent such a lot already on this blasted painting that we must not forget that we ought to get it back in pictures. If we dare believe, and I am still persuaded of it that the impressionist pictures will go up, we must paint plenty of them and keep the prices up. All the more reason for concentrating quietly on the quality of the work, and not wasting time. Then at the end of several years I foresee the possibility that the capital we have put out will have returned to our pockets again, if not in cash, then in the value of the stock. Meanwhile, if you approve, I shall furnish the bedroom, either hiring or buying it for cash down; I shall see about that today or tomorrow morning. I am still convinced that nature down here is just what one wants to give one colour. So that it's more than likely I shall hardly ever budge from here. Raffaelli has painted Edmond de Goncourt's portrait, hasn't he? It ought to be fine. I've seen the Salon, published by L'Illustration. Is the Jules Breton good? You will soon be getting a picture I painted for you for the first of May. I could quite well share the new studio with someone, and I should like to. Perhaps Gauguin will come south? Perhaps I could come to some arrangement with McKnight. Then the cooking could be done in one's own place. In any case, the studio is too public for me to think it might tempt any little woman, and a petticoat crisis couldn't easily end in a liaison. Besides, morals here seem to be less inhuman and less contrary to nature than in Paris. But with my disposition, going on a spree and working are not at all compatible, and in the present circumstances one must content oneself with painting pictures. It is not really living at all, but what is one to do? And indeed, this artistic life, which we know is not the real life, seems to me so vital, one would be ungrateful not to be content with it. I have one less big worry now that I have found the little white studio. I looked in vain at heaps of rooms. It will sound funny to you that the lavatory is next door, in a fairly big hotel which belongs to the same proprietor. In a southern town I feel I have no right to complain of it, since these offices are few and dirty, and one cannot help thinking of them as nests of microbes. For another thing, I have water laid on. I shall put some Japanese things up on the wall. If there are any canvases in your apartment that bother you, this can always be used for storage, which will soon be a necessity, because you must not have any mediocre things in your place. Bernard has written me and sent sketches. I am very glad that you found our mother and sister well. Are you going back to Holland for the holidays? If only you could manage both, to go and see Tersteeg, and come to Marseilles about all this impressionist business, and between these two jobs have a rest at Breda! Have you seen Seurat again? A good handshake for you. I wish you a year as sunny as today is here. If you send me 100 francs next time, I could sleep this very week at the studio. I will write you what arrangement the furniture dealer is willing to make. Vincent van Gogh. Letter to Theo van Gogh. 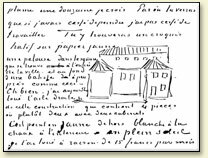 Written 1 May 1888 in Arles. Translated by Mrs. Johanna van Gogh-Bonger, edited by Robert Harrison, number 480.